Yesterday we took a family day trip as its the last weekend before we go back to school and other things begin to get in the way. So we travelled past Swansea to Carmarthen first for a few hours shopping. Its a lovely welsh town with everything you need from Topshop to BHS, as someone from South Wales I feel like a tourist up there as a lot of the locals speak fluent welsh. Then we drove on for another half an hour to Saundersfoot. Which is a beautiful little beach town with great shops near Tenby. Of course we couldn't go to the beach without stopping for an ice cream. As a child (11-14) my family had a caravan in West Wales. Saundersfoot is very near where our caravan was and we used to spend many days on the beach here. Unlike where I holiday now (if you have been reading A Fashion Oddity a lot over the summer you will know a lot about these holidays) in Devon this area of West wales was all about the surf. The village we had our caravan in, called Broad Haven had a surf shop among the 4/5 small businesses in the tiny village which I went in regularly lusting over the likes of Animal and Roxy. I loved that even though I wasn't going to be a prof surfer anytime the clothes were actually pretty amazing, they did great bikinis, denim shorts and beach dresses. Whatever town you were in I would find loads of shops highly stocking in surf brands and once I would get back home to Cardiff I would never see the clothes in shop windows again. Brands like this often get forgotten about in the blogging world. I recently found an amazing european surf brand called Protest. Protest is a great board wear brand from the Netherlands. Through the summer they specialise in surfing and beach wear then in the winter its all about the ski and snowboard wear but don't fret its a lot more than just practical clothes. I also got this lovely t-shirt. Its the Sands t-shirt. I have worn this so much just with jeans and a matching hoodie. I love the colours and the slightly sheer fabric. I also love how the sleeves aren't a t-shirt sleeve but its not a vest top strap either. The little Protest label in the bottom corner is a little touch that you don't get from many brands. Excuse how creased these are but as you can see they have been well loved and used. The shorts a perfect as a more flattering version of board shorts and you can still wear them off the sand as they have lots of pockets however they are a little short for my liking. The top is such a soft good quality fabric with such a cute slogan (which didn't show up very well on camera) saying ' I've got sunshine on a cloudy day' I felt so summery wearing these. In regards to the fitting I am a U.K 8/10 and both tops I got in a XS and the shorts in a S. The tops fit beautifully (a lot better fit than most cheap t-shirts in my wardrobe). As all the above pieces are from their summer collection these are all in the sale now so make sure you check them out and have a browse at the whole collection. I have always felt coral colours usually suit more tanned skin tones so these tangerine colours aren't something I'd normally wear but there is loads I have my eye on online. 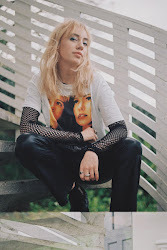 I hope you have enjoyed this post ( was something a little bit new for me but I finally got some outfit posts I am proud off) let me know in the comments how are spending the end of summer. P.S Very late on Friday night (29th of August) A Fashion Oddity hit 200 followers on Bloglovin' so thank you very much to everyone who followed and yes there is a giveaway coming. Welcome to this weeks blogger collab make up look. Now sadly for many including myself I only have a few days left of our summer holidays so I thought a back to school look would be the perfect look for this weeks post. This week I am collaborating with the lovely Becky from http://peacockbeauty.net/ so be sure to check out her post too. Now I know many schools have very strict make up rules but this wont be a 'no make up make up' look. As some of you may know I go to college rather than sixth form (you can read my post about this decision here) and one benefit of this is that I don't have a uniform so I am a bit more free with my make up to college. However I still go there to learn and nothing else plus I would always rather sleep in the morning than spend ages on my make up so this is a very simple make up look no bright colours, no contouring etc. So I used a CC cream then lots of concealer (my skin is so bad right now) and nothing else on my face as I didn't want a big fuss with bronzers and blushes. I filled in and gelled my eye brows as normal. Then I used the lightest shades in my trusty MUA palette and did a cat eye with black eye liner as the main focus of my look. I did a light coat of mascara and to complete the look I just used a 'my lips but better' lip-gloss shade from Natural Collection. I hope you have enjoyed this post and I hope you aren't too nervous about back to school. Let me know in the comments if you decide to check out Becky's blog for her back to school make up look. 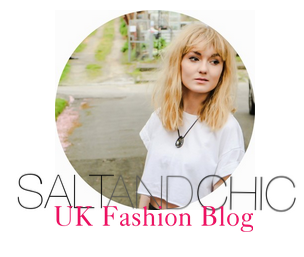 P.S I am nearly at 200 followers on bloglovin which is insane and thank you so much everyone who follows, if you love reading A Fashion Oddity (or you just want to help a sister out) you can follow here. There will also be another giveaway when I do too. I have been wanting to write this post for a long time but I keep meeting new bloggers on twitter and this list keeps changing but I thought I could do this post every few months so it doesn't matter! I probably only spend 10% of my online time writing my blog the majority is reading blogs and I was reading blogs for years before I started A Fashion Oddity. So here are a few of my favourite reads at the moment. Becky has had Becky Bedug since December 2011 and she is doing amazing. 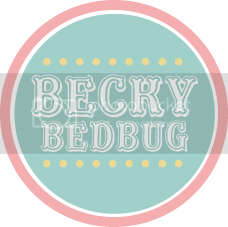 She has such a unique writing style and her personality really shines through in each post, this is such a quirky blog so if you are fed of reading the same old thing then defiantly check out Becky Bedbug. I love her very regular outfit posts and her monthly thoughts on the latest issue of Company magazine. she really inspires me as she is such a pillar in the blogging community and has come so far. Amy's blog is one that I only recently started reading but I am in love with. Amy is so beautiful that she makes me want to wear everything she wears. Basically her outfit posts are on top form. 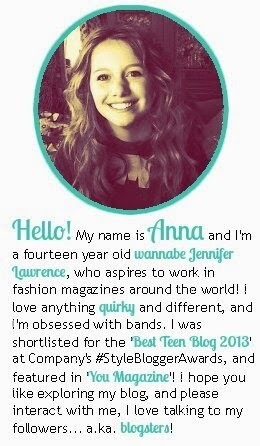 I recently got to know Anna and as you can see from her blog photo at only 14 she has achieved so much its actually inspiring. another blog that when I see a new post on my BlogLovin' feed I get excited to read. I haven't made any super close blogging friends that I chat to on twitter every night but Sweetheart Fashion is probably my closest blogging friend. Her blog is just beautiful (just look at the floral picture above) outfit posts are on point which they should be as she is a model haha. Her blog is so consistent and her outfit posts flow you really see her personal style through each one. So if you aren't following these beautiful girls already I really recommend that you check them out. Of course these four aren't my top blogs. Some of my other favourites are Fleur De Force, Lilly Pebbles, Wishwishwish and The Blonde Salad just to name a few. These are the women who inspired me to start a Fashion Oddity in the first place and I admire them all so muh. 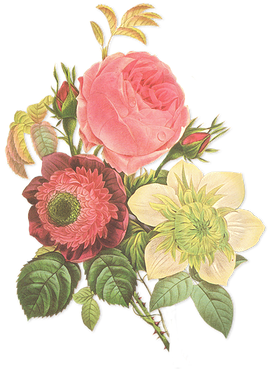 I hope you have enjoyed this post and let me know in the comments if you have discovered a new favourite read. So here is the third and final instalment of my holiday posts. (part one is here and part two here) I hope you have been enjoying them. On Wednesday we headed off on an hours drive from Torbay to Salcombe. Which was "our big day trip of the holiday" I quote. I had only heard about Salcombe due to it being the home and birth places (correct me if I am wrong) of both Jack Wills and Joules. But boy this little seaside town was more than just an expensive shopping destination. I fell in love with the view as so as I stepped out of the car and started snapping away with my camera. It was a lot smaller than I expected. All the shops are on one street with a few narrow lanes with restaurants leading down to the harbour where you can get quick little ferries across to the beaches on the other side. I really wish I had the chance to get the boat across to these little beaches....beautiful! The main high street is full of pretty bunting, restaurants and such a wide range of wonderful shops. Pretty much heaven right? A pink sweet shop what more do I need in life. This man made the best fudge I have ever tasted right in front of me. YUM! Chocolate malteser flavour ice cream. Ah the original Jack Wills. This was one of my favourite independent shops I went in. It is called Amelia's Attic and sells such a variety of beautiful stuff. Everything from the stock right down to the wallpaper is beautiful. I wanted to buy literally everything. This was the kind of shop I dream of owning. I really felt in my little heaven here. Oh and for all you Made in Chelsea fans out there this shop is owned by Cheskas mum. This shop was like a dream, she even sold Victoria Beckham. Another cute home ware shop. Salcombe is full of these kinda of shops that sell pretty little bits that you really don't need but want like candles and dainty ornaments. On the way back from Salcombe we stopped off at Totness. However most of the shops were closed (what was the point?) i took photos of like 30 cute shops but this post was already long enough so here are two of my favourites. Totness has every kind of shop you want from whole food grocers to jewellery shops and cute vintage clothes stores. The top one is called Naria and its an antique and 'time travel' shop aw how I wish it was still open when I got there and the second one caught my eye because of these beautiful Alice in Wounderland paintings on the wall. I had a beautiful surf and turf burger and it was so good. Everyone knows prawns are my weakness so with a proper piece of steak in a burger man i was in heaven. As if that burger wasnt enough I had this amazing Rocky Road brownie for pudding aw it was honestly one of the best meals i have had in a long time. On the last day of our holiday we just had a chill day on the beach. I really hope you have enjoyed this post, let me know in the comments as always. Thanks!